Nathaly Batista-Morales will give her grant-winning presentation, “Their Words, Their Worlds: Amplifying Bilingual Learners Voices through Advocacy,” on Saturday, November 17, 2018, from 11:00 a.m. to 12:15 p.m. and receive special recognition during the ELATE Luncheon on Friday, November 16, 2018, at the NCTE Annual Convention in Houston, TX. 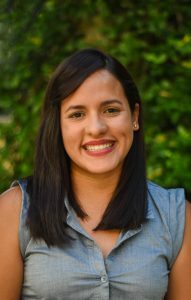 Nathaly Batista-Morales is a Puerto Rican, third-year doctoral student at The University of Texas at Austin in the Bilingual and Bicultural Education program. Her research centers on the development of critical literacy practices in the bilingual, early elementary classroom with a focus on advocacy and activism. She also seeks to understand how these critical literacy practices can be centered in literacy courses in teacher preparation programs. Nathaly teaches Reading and Reading Assessment courses in the bilingual preparation program and serves as a student teacher mentor. To increase participation in ELATE on the part of teachers and teacher educators (including graduate students and student teachers) from historically underrepresented groups whose presence and whose contributions are central to the full realization of our professional goals. This grant offers up to two $500 awards for first-time NCTE Conference presenters who are members of groups historically underrepresented in NCTE and ELATE. Any teacher, teacher educator, or prospective teacher (graduate students and student teachers) in the English Language Arts, who is an NCTE member and represents an historically underrepresented ethnic group in NCTE (African American, Asian American, Mexican American, Native Hawaiian, Puerto Rican and other Latina/Latino American, and American Indian) and who has not previously appeared as a presenter at an NCTE annual conference is eligible to apply. Grants will be given to the applicant or applicants whose Program Proposal and past accomplishments indicate the greatest potential for contributing to the mission of ELATE. Grant applicants must submit an NCTE Annual Convention Program Proposal to NCTE and receive an acceptance to present at the November convention. The proposal may be submitted for an individual or panel presentation. A brief letter of application explaining how you anticipate your presentation (include your accepted proposal title) benefiting your colleagues. A brief letter (no more than one page) describing your professional or pre-professional background. A brief letter of support from a senior colleague or mentor commenting on your accomplishments or promise as a teacher or teacher educator.